What happens when there is sudden silence? What happens when there are the two of you in the car? The endless empty road in front of you lit only by the headlights. And there is silence. Does it grate and bite at you? Does it make you want to crawl elsewhere, far far away. And pretend that it doesn’t exist? What if the last word spoken is “oh”? A feverish, submissive “oh”. And your mind turns blank. Blank like the darkness. Do you pretend to fall asleep? To shake away the intimate moment you thought you had an hour ago? Do you know that when you wake up, you make up an excuse that it was the dinner that made you sleepy? Do you try to squeeze into your chair as if you did not exist? For the last 3 Saturdays, I have been sick. Runny nose. Sneezing. Watery eyes. Then…this past Saturday, I was fine…until Sunday when all I wanted to do was lie in bed and do nothing to ease the drippage. Then today, I feel out. My chest feels like it’s full of fluid. Why does it feel like I am 80 years old when I am only 26? I am not quite sure about my current registrar, but my domain is now back! For some reason or another, I never received notification about jennism.com expiring on…Christmas. When I logged into my control panel, it showed that my domain still had the same status as last year—transfer in progress. There wasn’t even an indication to show when the domain expires. Escapism? Surely. 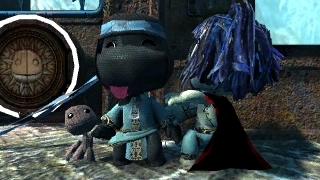 That’s why for the last few days I have immersed myself full of blu-ray movies, tv shows…and my latest favorite game, Little Big Planet. Granted, I have horrible hand-eye coordination and rhythm timing. But because I could get through the game depending on other players (namely Chris), it really wasn’t that bad after all. It’s not because I could customize my character to my heart’s content or the funny narrator’s voice. Or the stories…shallow, but sufficient enough to carry the gameplay. 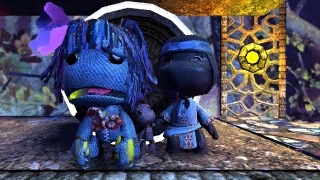 Or that there were really two controls to move my sackboy (or sackgirl). Or that I really loved the music. It was that I could get to the end. One of the few games…I think that I have completed all levels even if it was dependent on other people’s cooperation and them dragging me along as I died and died again. Yesterday afternoon, I giddily got my keys to find treasures in my mailbox. Then I realized that there was a man in a sleeping bag underneath my mailbox. My neighbors watched me as I attempted unsuccessfully to get around the man. A few months ago, I complained to my landlord to check our lights because there were always random people drinking from paper bags on my steps. The light was supposed to shoo away people at night. Usually I did find the stairs clear and unfortunately sometimes I couldn’t tell if they were neighbors or random strangers. I uncomfortably tried to get to my mail, trying not to straddle the sleeping man as I shimmied to get my mail. No treasures, unfortunately. This afternoon, the man was still there. Chris saw my anxiety and knew that I was too chicken to call the police. Recalling an episode from season 5 of the wire, he called the cops reporting that there was a man who hadn’t moved for 24 hours and he was afraid of talking to him. A fire ambulance arrived in 1 minute 38 seconds and the man woke up reluctantly. He cursed loudly while I hid behind the blinds of my second floor apartment. The emergency crews gave him a pamphlet of nearby homeless shelters. There is a truck parked in a red zone in front of my apartment when the emergency vehicle arrived. I wonder if the truck got a parking ticket. It was raining outside. Carefully, I teetered in my black boots with a heel down the long stairs down Van Ness station. People rushed down past me to my right. I felt like Mr. Glass as I walked down and I wondered what would happen if I did tumble. In the station, my feet ached from my boots. Unlike my sister, I couldn’t do the heels. I saw a row of four blue seats. Clean. I dusted off the last one and sat down with my black garbage bag. An Asian man with a fisherman’s hat glanced at me. He was my dad’s age. Probably older. Wrinkled. Slightly tall. He crouched slightly as he stood seven feet from me. As I sat, he glanced at me observed the garbage bag I had dragged and the layers I had put on to save me from the cold rain. As an immediate response, he looked away. But I tried not to waver. I nodded in respect. Good day, sir. Isn’t it such a rainy day? He kept staring at me. I stared back, willing his eyes to look away. When I turned my face to see the incoming train, he immediately turned to stare. I stared back. When the train finally arrived, I got in the first car deliberately even though it was far from where I sat. There was an overhead announcement—a guy with a Giants jacket had jumped the gates. The train paused while the guy with the Giants jacket sulkily headed back upstairs. But went into the photo booth anyway! Two weeks ago, I finally uploaded my digital photos to print at riteaid.com There was a 50 free print coupon. I couldn’t find 50 good ones and uploaded 41. I chose the Rite Aid downtown and was happy. Last week because I didn’t have a printer, I wrote down the confirmation number on a slip and went downtown. Stupidly, I didn’t argue that if she looked inside the photos she was holding that she would see many photos of me from multiple angels. Instead, I sullenly went home and planned for my next step. Today, I stumbled down to Rite Aid during my lunch break. The photo area was EMPTY. I saw some people in the back room, but was afraid they would kick me out of the store if I went behind the counter to knock at the door. “There isn’t now,” I said with a rising anger. A few minutes earlier, I noted that someone requested customer service at the ice cream counter, but the counter was still empty. I stomped back to the photo counter where it was still empty. A few customers had been waiting to pay for the copies they made from the copier. After waiting for another five minutes, they walked out. Eventually, I started waving to the one-way window that was part of the back room. A panicked wave. Finally someone noticed me…and came out. Finally she called another photo lady who recognized me from my first visit. “How am I supposed to charge her?” the employee asked. How are you supposed to charge me something that doesn’t have a price on the receipt? I thought in annoyance. I stomped angrily out of the store, vowing not to print my photos at Rite Aid again. A few moments later, I opened the packet of photos as I was crossing the street. I dropped the cover receipt which had my name and phone number. A few steps later, I saw it in the middle of the street and quickly rushed back to pick it up. Good thing I am now in the financial district. I gossiped a bit more with my Korean friend when suddenly my phone rang again, detailing her troubles. “NO! GET OUT!” he yelled and she raced out back into the street in fear. I did find her where she was shaking slightly from the terrifying man. Leading her upstairs, I showed her the spiked punch, the hot appetizers and drinks.